Catholic Charities of Baltimore provides a variety of programs throughout Maryland to assist people who are struggling to make ends meet and striving to work their way out of poverty. These programs assist low-income people and families to achieve self-sufficiency through a range of transitional housing services, meal programs, education, employment and counseling services, and through referrals to other support services. 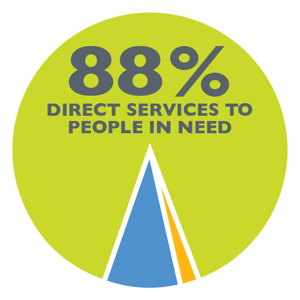 Our aims are to help prevent people from slipping into poverty, to assist those experiencing poverty to escape and to improve lives. Click here to view or download the 2016 Maryland Poverty Profiles document from the Maryland Alliance for the Poor. Download or view our list of food pantries. Please note: the information on this pdf may have changed since this posting. meals were served to men, women and children who were hungry in FY 2018.
bed nights were provided for individuals without a place to sleep in FY 2018.
individuals with emergency and/or casework management services in FY 2018.